Bites of Beijing | Have you eaten? Li Ji Traditional Snacks, sitting in a narrow hutong just north of Houhai, specializes in traditional sesame buns, or shaobing. They also offer a small-but-excellent selection of other Beijing classics, like boiled tripe and lamb soup. 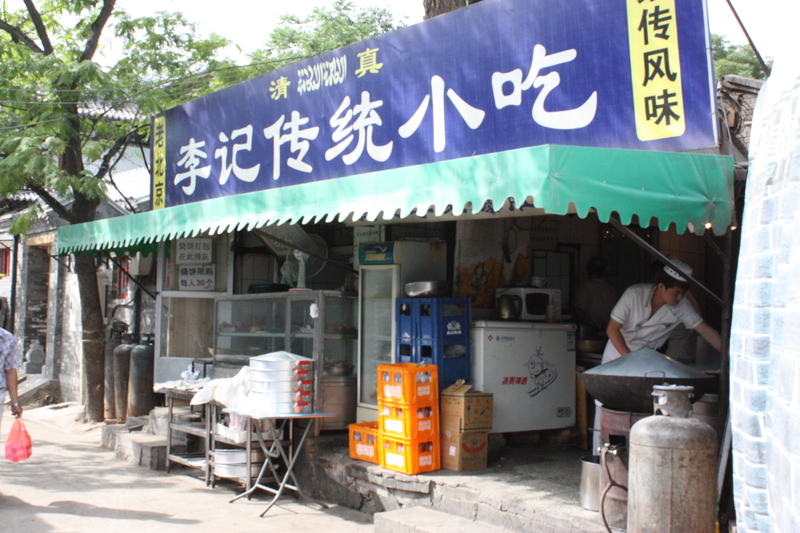 (You won’t find any pork here – Li Ji is run by Hui Chinese and is halal only). The shop is well-known among Chinese visitors, resulting in an interesting mix of customers. Tattooed Hui guys and bearded lao Beijing grandpas rub elbows with iPhone’d xiaojies posting their shaobing excursion on Weibo. Li Ji is managing its popularity with grace, resisting the neon craze going on in most of Houhai. The prices are low and their hospitality is genuine. A smile and a polite question or two are enough to get invited into the open-air kitchen, where you can see the shaobing being rolled by hand. The dough, to which sesame paste is added, is stretched and twisted until it makes a bun filled with hundreds of thin, soft layers. 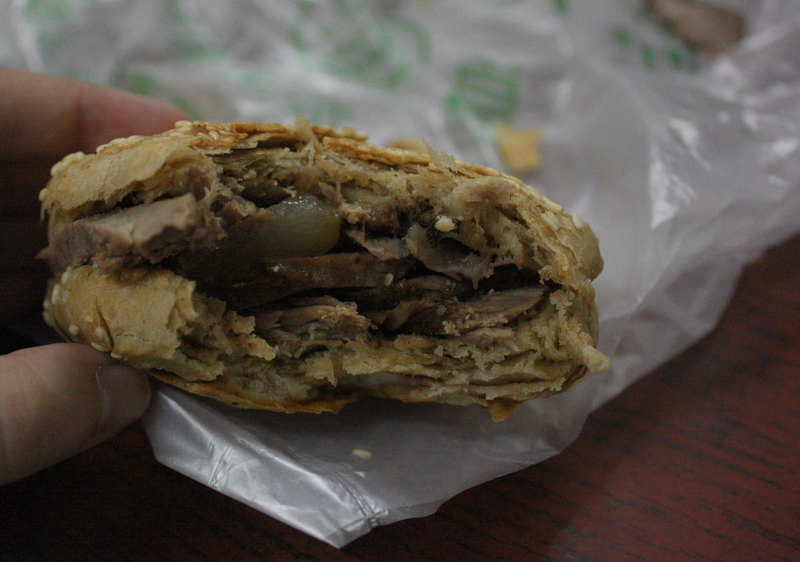 The outside is then dipped in sesame seeds and baked, making a flaky, tender bun that’s an excellent vehicle for silky slices of beef (just ask for shaobing jia niurou, 烧饼夹牛肉). You can also have your shaobing plain, with ma doufu. Ma Doufu isn’t exactly good to look at; its name translates to “freckled/spotted tofu,” and it’s a kind of off-brown colour. It is, however, good to eat. It’s made of mashed, fermented mung beans, and was traditionally eaten by Beijing’s poor (perhaps since ma doufu was considered an unwanted byproduct of the classier douzhi, fermented mung bean juice). It’s usually fried in lamb fat and topped with a little chili oil. Don’t be put off by its colour: ma doufutastes rich, sour and oniony. It’s an unusual taste, but I liked it on my very first try. In fact, the combination of ma doufu and shaobing put us in mind of bagels and cream cheese – a sesame bun and a fatty, savoury topping. I’ll be back the next time a sesame craving hits. BoB has a new feature, the Food Map of Beijing – a Google Map that plots every restaurant and market I’ve visited. Now it’s easy to see what restaurants are near you – and just click on any tab to get a short description and link to the relevant post! The map is a little Gulou-heavy, and biased towards Beijing’s northern half – I’ll be working on that over the next few months. With mala xiangguo “hot-numbing fragrant pot”, the process is part of the pleasure. At the restaurant outside Beijing Normal University’s South Gate, you’re faced with a list of at least 40 different vegetables and meats from broccoli to bacon. Four or five choices are good for two; my favourites are the lotus root and broccoli, which drink in the chili oil but keep their own flavour. The ingredients you choose are then tossed in a hot bowl full of oil and spices: chili oil, lantern chilies, deep-fried garlic and ginger, salt, and of course a handful or two of Sichuan peppercorn. You’re at the mercy of the chef and your tolerance: a few too many peppers and it’ll burn like hell. But if the balance between chef and eater is right, you’ll be in hot-and-numbing heaven. 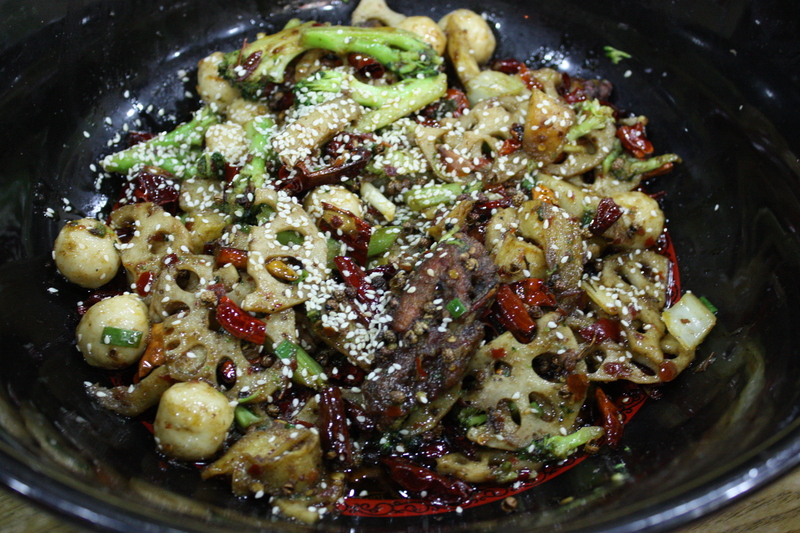 A lemony buzz from the Sichuan peppercorn and smooth, rich heat from the chili oil animate the vegetables. And thousands of others…just search 麻辣香锅 on Dianping! I used to be a serious jiaozi-hater. The fillings always tasted the same: meat drenched in too much soy sauce. They’d be filled with almost-raw chives, or have wrappers that fell apart. It didn’t seem to matter what we ordered; they all tasted the same! Every time I ate them, I would make unfavourable comparisons with ravioli in my head and promise myself never to spend money on jiaozi again. 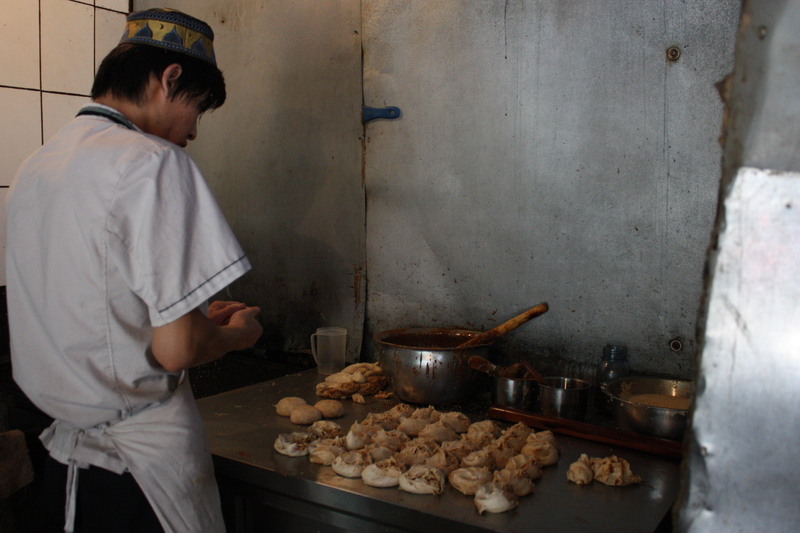 It took Baoyuan Jiaozi Wu’s creative, clever jiaozi to change this dumpling-hater’s mind. 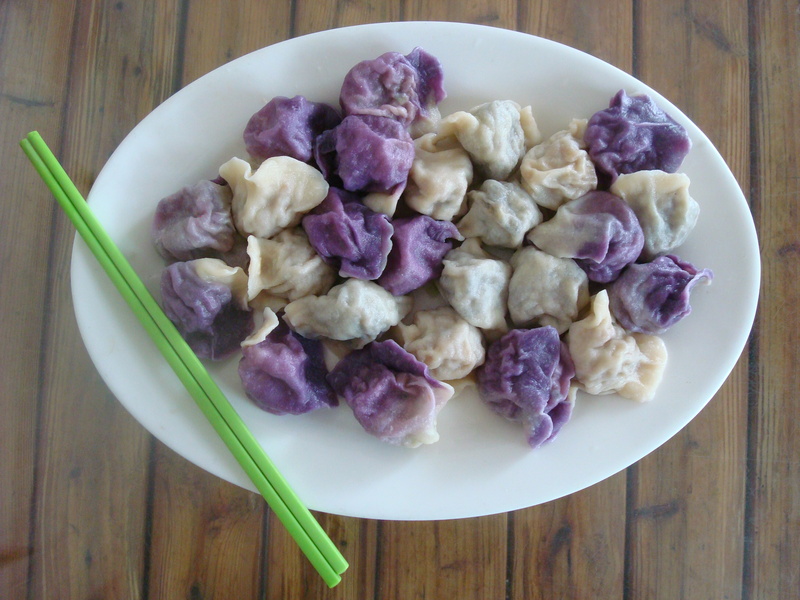 Their jiaozi wrappers are beautifully coloured – orange, purple, green – making a cheap meal feel festive. (This makes up for their being a little too thin and loose for my taste). But what really makes Baoyuan’s jiaozi great is the combination of ingredients in the fillings; they’re fresh, innovative, and texturally interesting as well. Their lotus root and zucchini dumpling (below, left) was delicious! The lotus root, chopped fine, was very crunchy, contrasting with the soft zucchini. This dumpling’s delicate flavour matched nicely with the vinegar at the table. The smoked pork, radish and chili dumpling (below right) was very, very fiery. Chili addicts will love the mix of chili heat and savoury, fatty smoked pork. The radish added sourness and crunch. 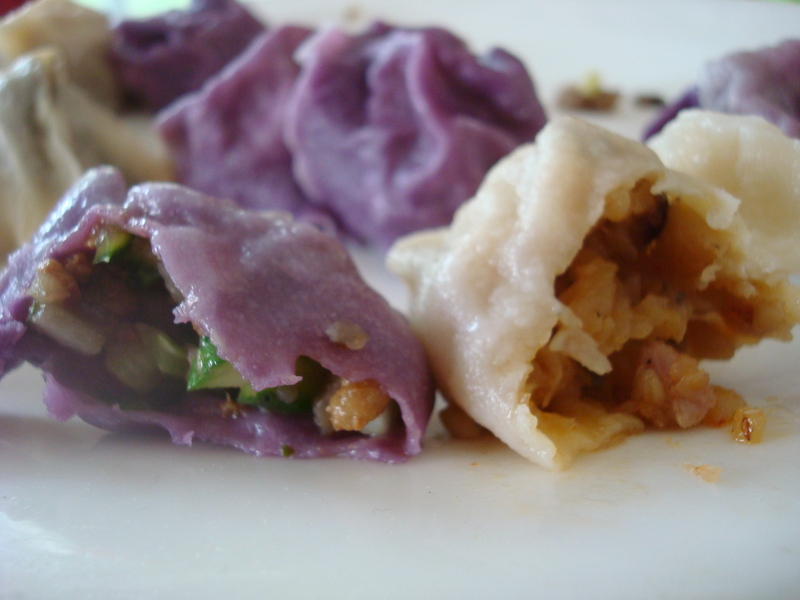 Baoyuan Jiaozi Wu has a Sichuanese menu as well, but we decided to focus on the dumpling offerings. 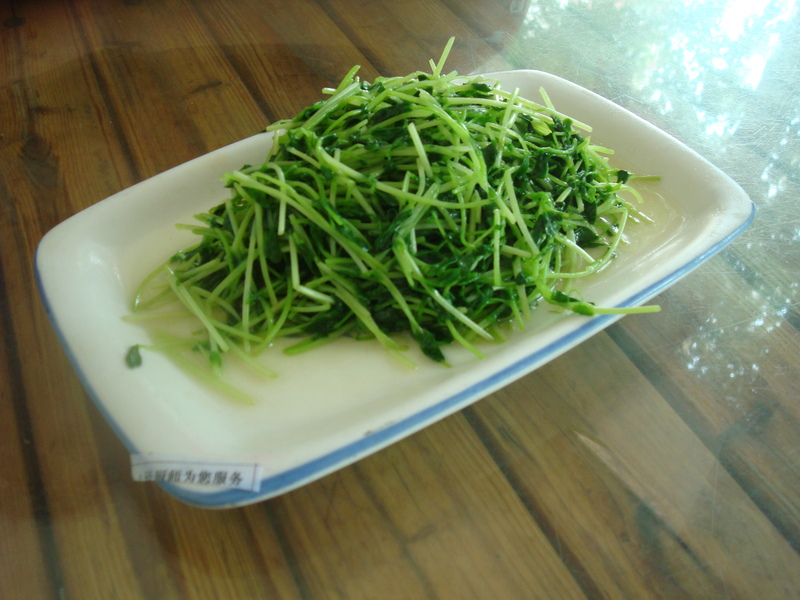 However, a stir-fry of pea shoots (清炒豆苗) was very refreshing, salty with barely a touch of oil. North of 6 Maizidian Jie, Chaoyang District (it’s not hard to spot if you look out for a big red-and-white sign with the name of the restaurant in characters). It just doesn’t get more Beijing than a plate of dumplings. Xian Lao Man is in my estimation one of the better places to eat them, and drink up a uniquely Beijing atmosphere. * If you go at the right time, the restaurant is packed and noisy, bright lights, very chaotic, just the way it should be. Order a jug of sour-plum juice (酸梅汤) and appreciate where you are. 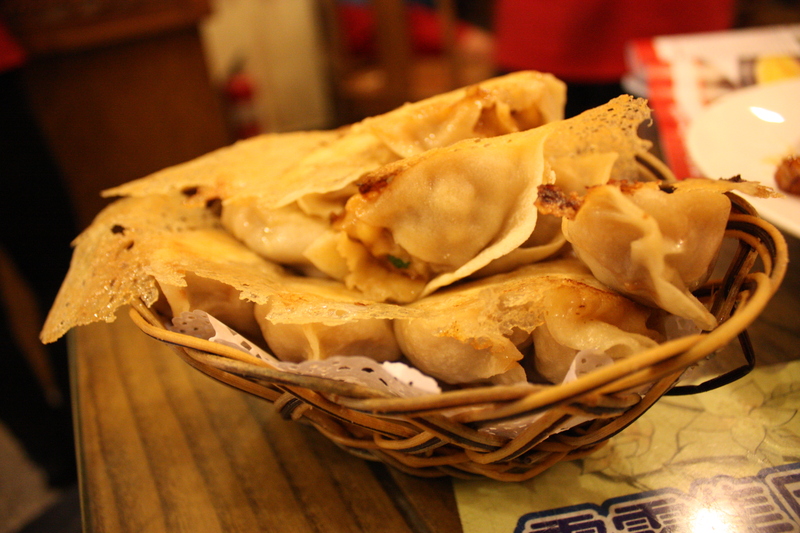 Their dumplings are really well-done, with taut, thin wrappers, fresh fillings, with the dumplings just the right size to eat in two bites. I like them made into guotie (i.e. fried), it makes for a crunchier, more interesting texture. They come with plenty of fillings – I especially liked the pork-and-corn (猪肉玉米) variety. And that crispy-skinned fish-fragrant eggplant (鱼香脆皮茄子)! What a star! What an exciting dish! Fish-fragrant eggplant, with its sweet-sour-spicy sauce, is always delicious, but here the skins were crunchy, adding a fun textural element and making the dish new again. For full list of locations see the Dianping page. *As it happened, I was reading City Weekend’s best restaurant guide while eating. Xian Lao Man was not mentioned. In fact, of their many categories only two Chinese restaurants were mentioned: Da Dong and Din Tai Fung. Do they know what City they are in? At any given time in Beijing, where all Chinese cuisines are available night and day, there’s always one region that’s hogging the spotlight. Taiwanese is enjoying attention now, and Sichuan is always popular. But the star of the moment in Beijing is, definitely, Yunnan. There are plenty of great Yunnan restaurants out there now (Middle 8th, Dali Courtyard, In & Out) that are all as good as they are expensive. Equal deliciousness can be found at Dali Renjia in Baochao Hutong, with an interior slightly dustier and a price slightly friendlier. Jasmine flowers stir-fried with egg (茉莉花炒鸡蛋). 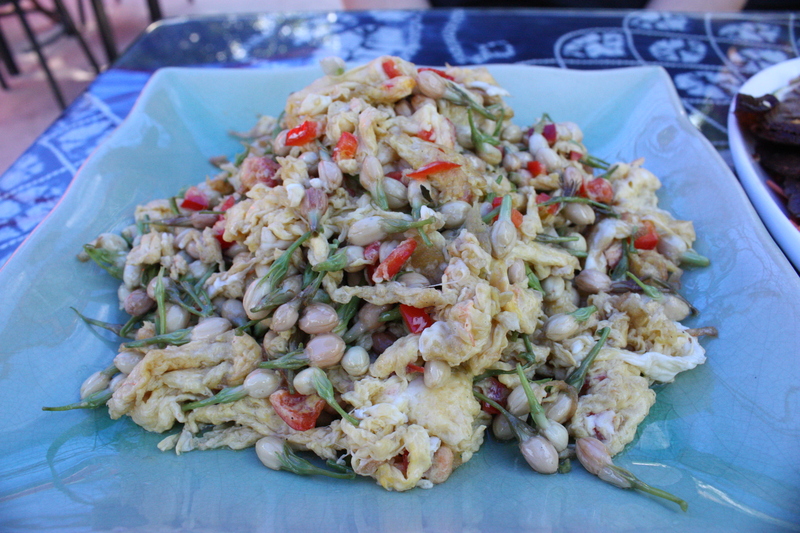 The flowers are more buds, and their gentle herbal flavor is perfect, PERFECT, with the salty stir-fried egg. The combination is a Yunnan classic. The beef with lime (柠檬牛肉) isn’t delicate at all. 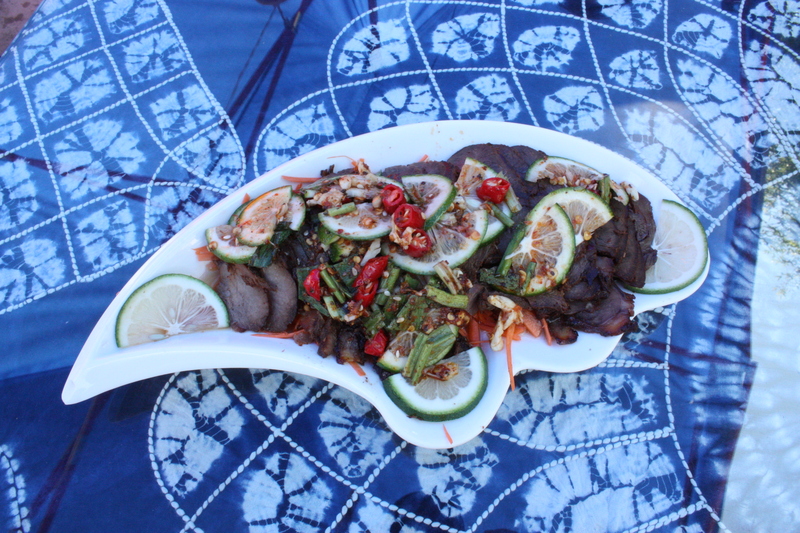 Cured beef slices are covered in vinegar, lime, mint, and chilies, making the dish very acidic and spicy. And addictive. 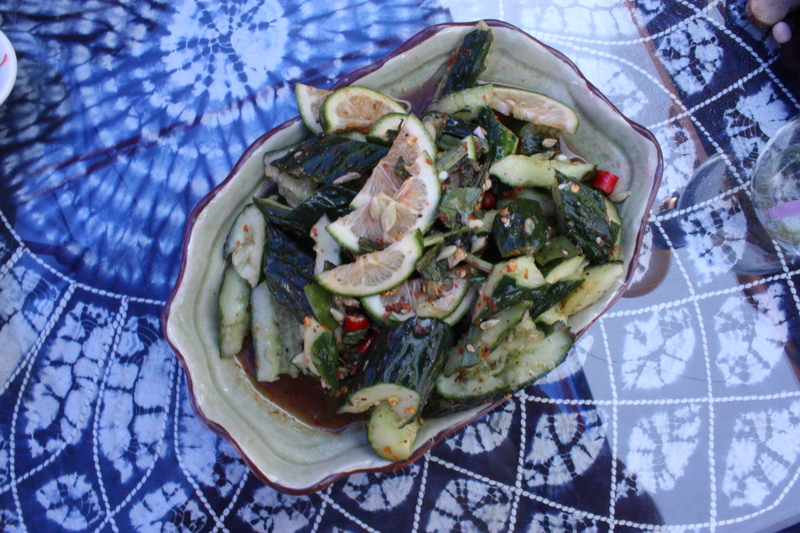 Cucumber salad is always delicious, as in smacked cucumber, （拍黄瓜) but this lime cucumber salad (柠檬黄瓜) kicks it a crazy notch up with extra acid from the limes and a huge amount of chili. This one had me running for the fridge for drinks and sniffling hard – I’m a chili addict so I loved it. The day I took pictures they had run out of pea tofu (碗豆腐), but if you’re a tofu lover don’t forget to order it – the lightly pea-flavoured tofu is dressed with vinegar, chilies and soybeans; it’s pretty sublime. There’s no question, Dali Renjia is an awesome place to eat in Gulou, with a great rooftop view away from the Nanluoguxiang crowds. 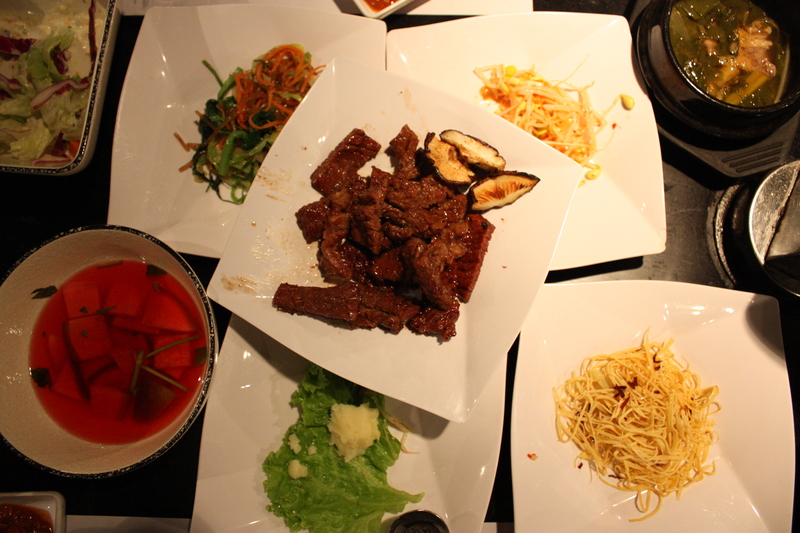 This meal cost us about 50 RMB each (if we had ordered more meat dishes, it would have been more). 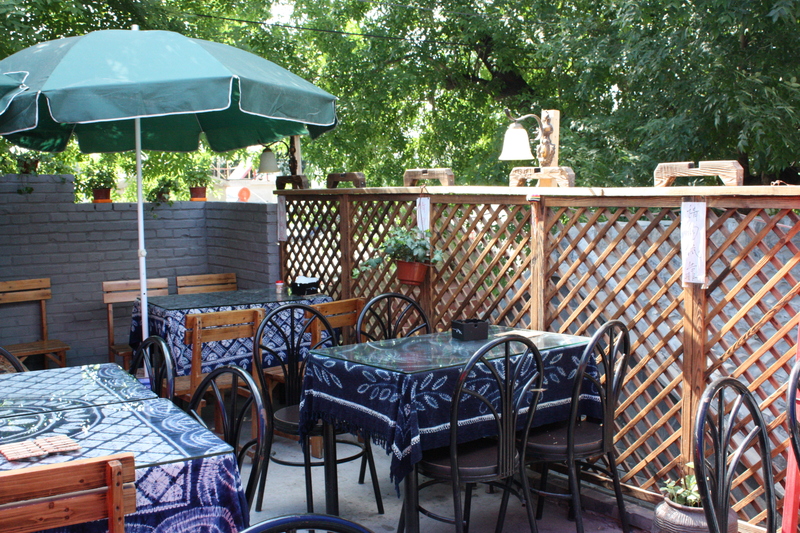 That, plus the service is always great – casual but attentive, and the waiters have suspended their break time more than once to serve us a midafternoon meal. Opening hours – ??? They are never closed at lunch or early dinnertime. 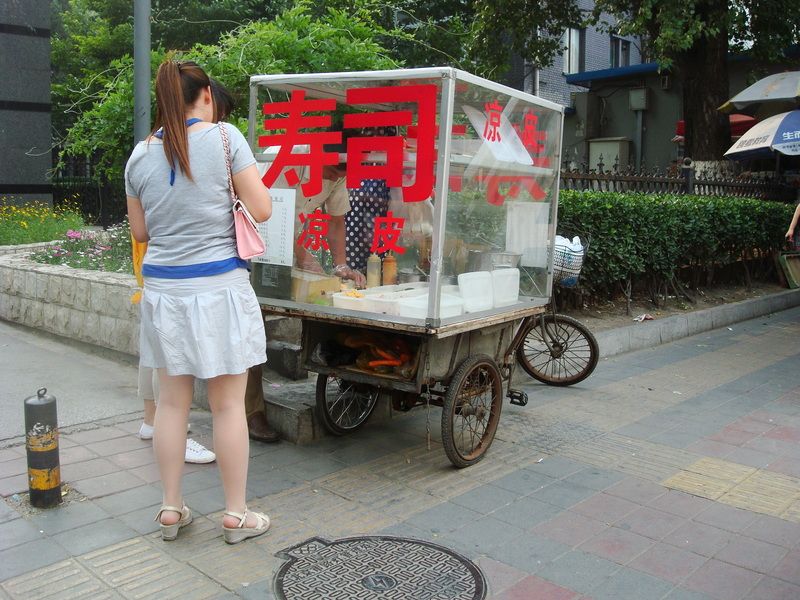 Yes, this is a sushi street food cart. You may not have thought sushi could be street food…this just goes to show how Beijing is a city that questions your prejudices! Confronts your assumptions! Except that assumptions sometimes turn out to be right. Street sushi is not delicious. Best go to Invincible Ramen instead. In a nutshell: Invincible Ramen is great. Is it as good as the best in Tokyo? No, definitely not. Does it serve above-average, delicious bowls of noodles? Absolutely! 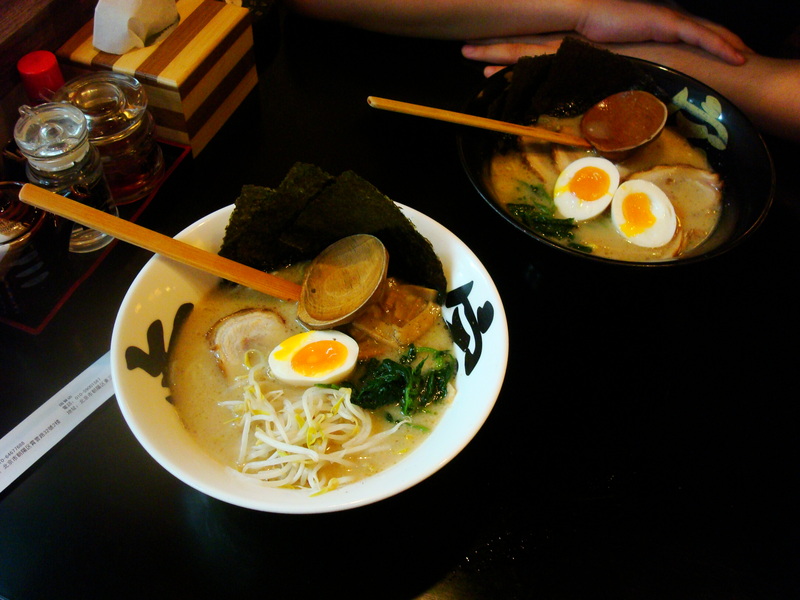 Cheers for Invincible Ramen! 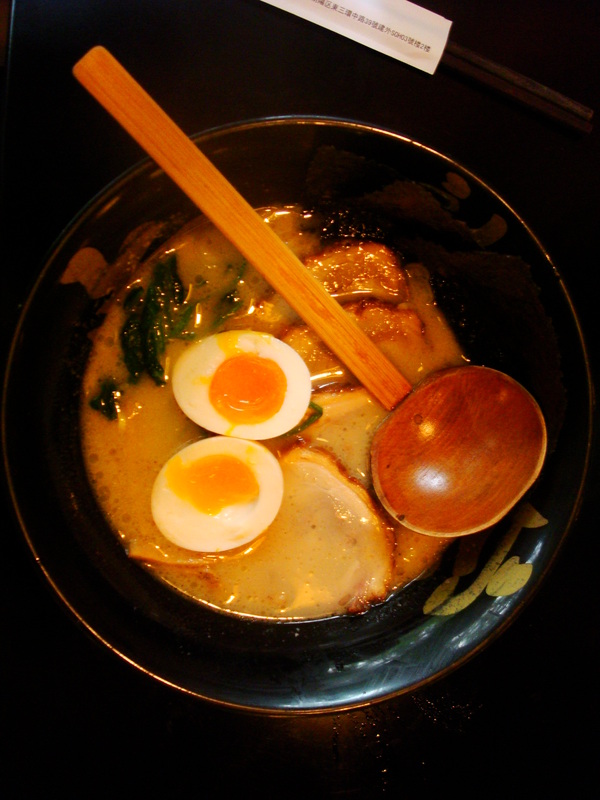 It helps if, like me, you like your ramen soup made with pork bones. 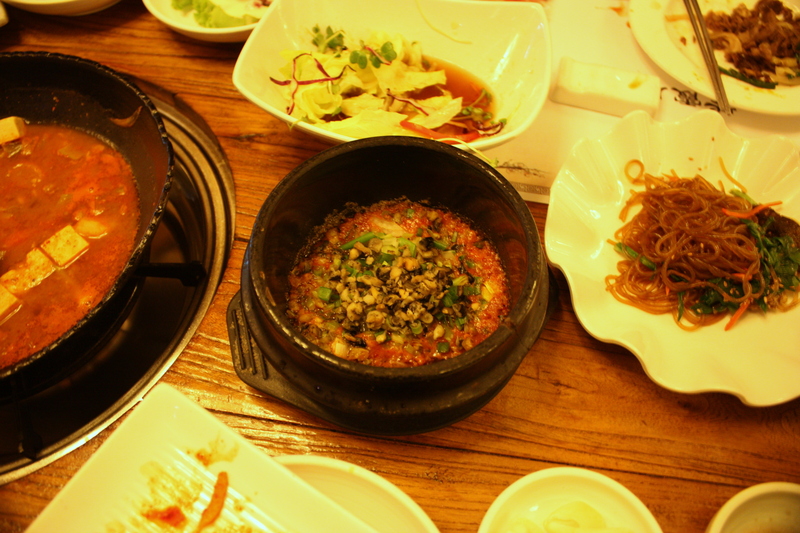 Both bowls that we ordered (we chose the most popular items, too) were fatty and creamy from long-simmered pork marrow. The “gold-signboard noodles” (黄金招牌面) were less fatty, with extra bonito fishy flavour and more salt. The “white-gold BBQ pork noodles” (白金叉烧面) were less salty but even richer, tasting like pure pork bone soup. To be done right, the soup has to be simmered for hours and Invincible’s certainly tasted like it was done properly. The broth was practically gravy, succulent marrow blended perfectly into the soup. The noodles were solid – they had a pleasant chew – but they weren’t first class, with little flavour of their own. 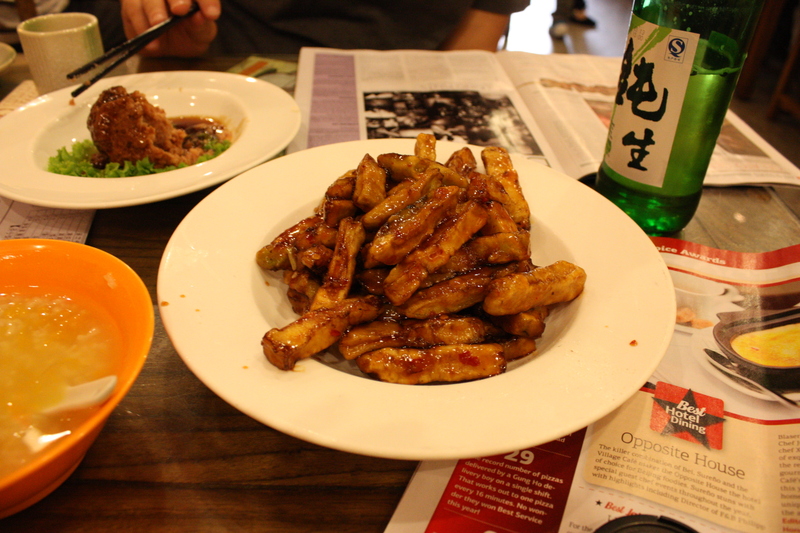 The pork, meanwhile, was very fatty and soft, falling apart with a tiny push of the chopsticks. The pickled bamboo had a special touch – it was dusted with a little black pepper, which really made its flavour shine. 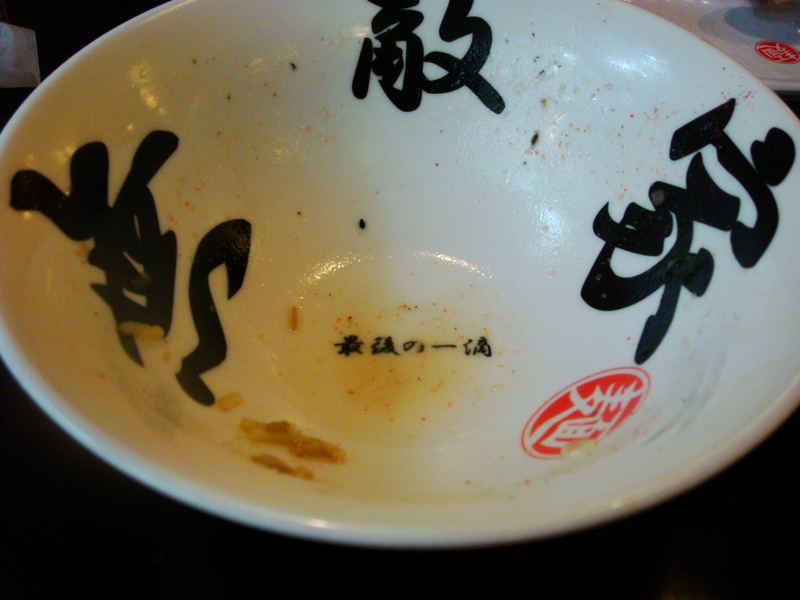 The bottom of the bowl reads “the last drop”! 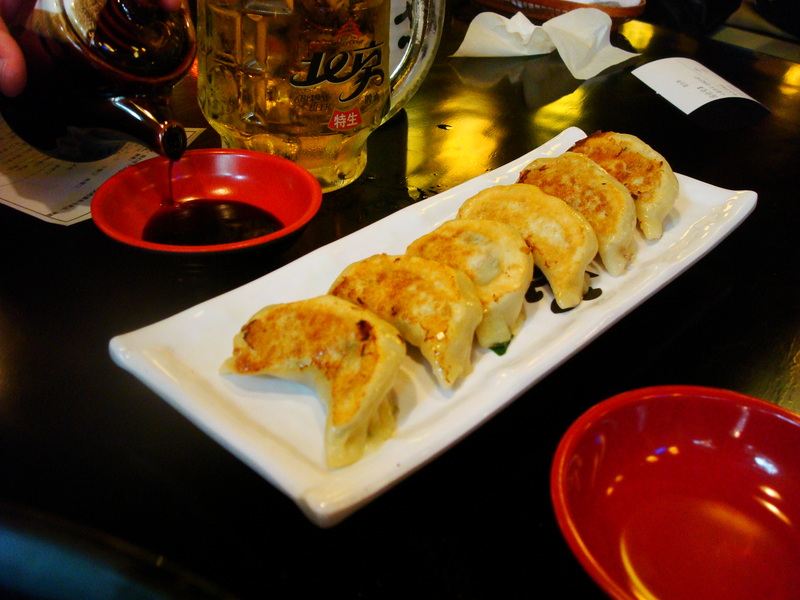 We tried the gyoza (煎饺), but they were a disappointment, unfortunately, packed with chives that made the whole dumpling taste way too sharp. But it didn’t matter; our whole focus was on our bowls of delicious noodles. It’s especially fun to experiment with the various spices on the table – my favourite was the nanami togarashi, the Japanese chili powder mix. 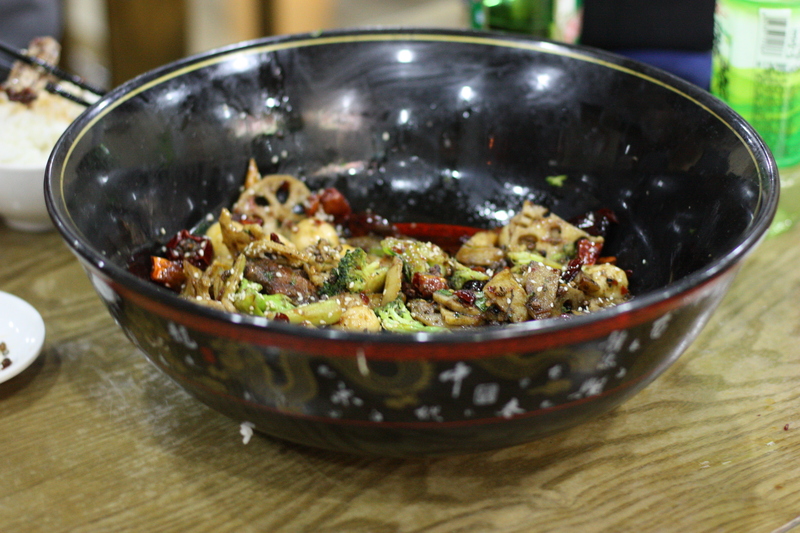 All that, and the noodles are very affordable – 35 RMB is very decent for such a satisfying meal. Well, we just don’t have red bayberries where I come from. 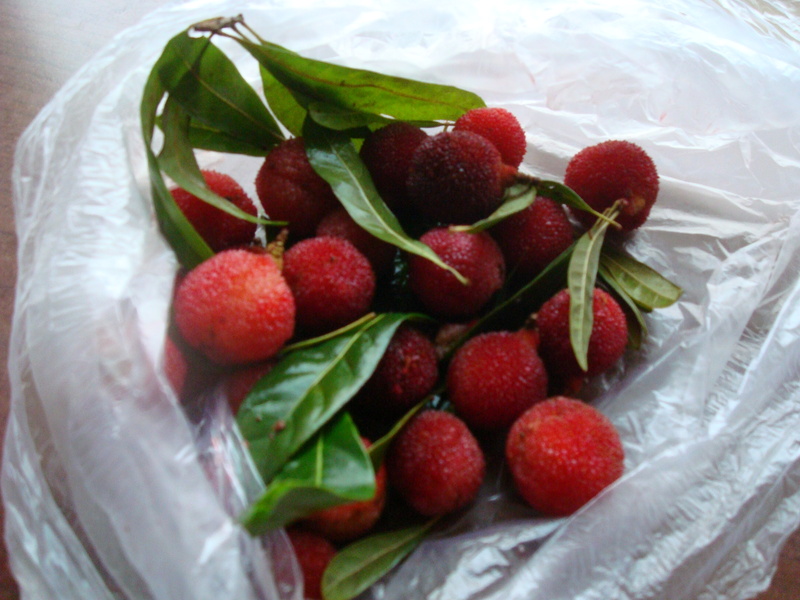 They are very sour, but fascinating, with a taste a lot like redcurrants. No need to peel – just eat your way through the outside layer, knobbly and waxy but very thin. Available from a cart probably within 100 feet of you! Tan Tan Da Lu may just be the best Korean barbeque in Wudaokou. 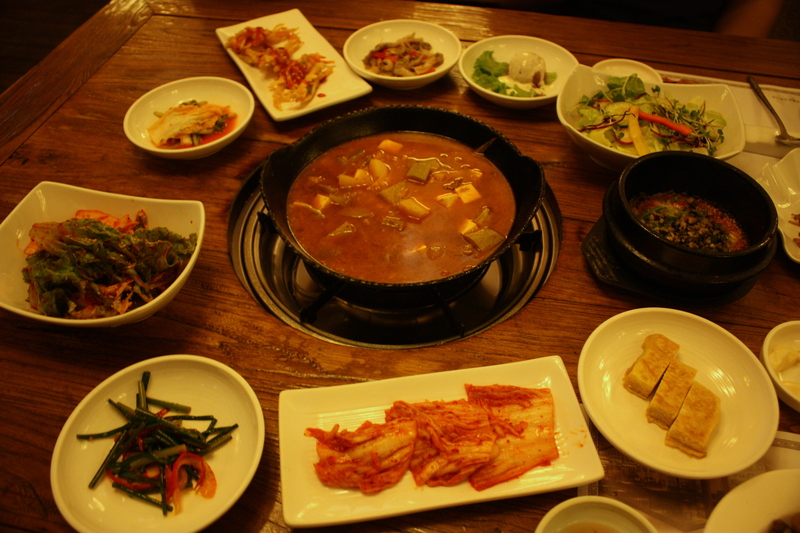 The food is straightforwardly good, never playing with your expectations. The place is full of rowdy students, giving the place a collegiate, greasy spoon kind of atmosphere. 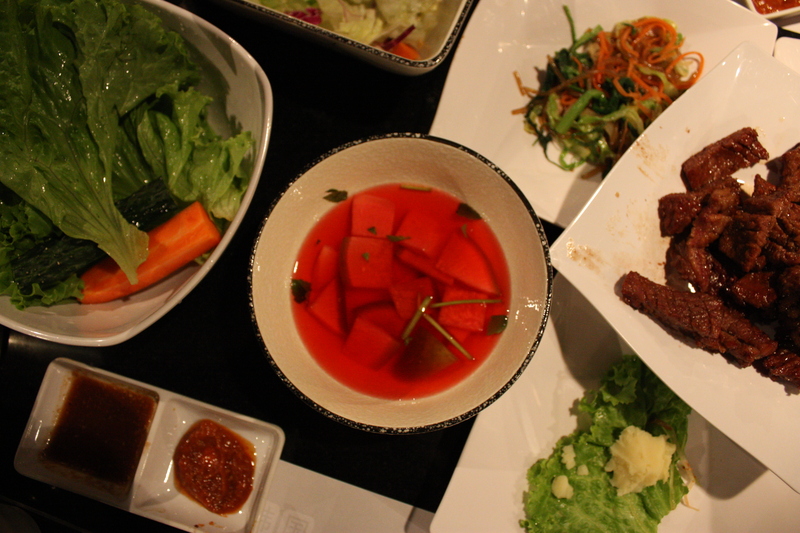 Dinner began with the usual spread of banchan, cold appetizers. These were pretty average, but we appreciated them all the same. They are just the frills. Tan Tan’s radish pickles are particularly nice (and good to look at, too). We settled on a bottle of makgeolli (生米酒). At 35 RMB it’s not too pricey, and its milky, lemony taste is very pleasant. Tan Tan Lu always feels kind of festive, what with the waitresses rushing around and students making a ruckus, and a bottle of strong rice wine heightens the effect nicely. Our grill was quickly brought and heated up: the waitresses seemed to be performing some kind of grilling relay race, one looking after it for five minutes, then wandering off, then another coming around. We never touched the thing ourselves (I always like doing the grilling myself, and you can at Kaorou Le, but sometimes it is nice to sit back and let it be done for you). Eventually the meat was done, and plates began to stack up on our table. 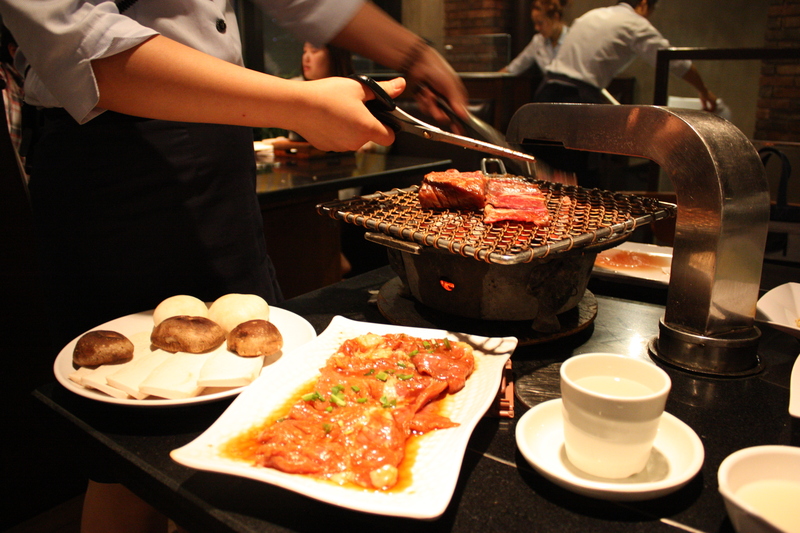 The beef (we ordered the seasoned rib at 88 RMB) was absolutely delicious, sweet and made VERY smoky from the grill. The flavor was smoothed down a little when we wrapped up the meat with lettuce and chili paste. 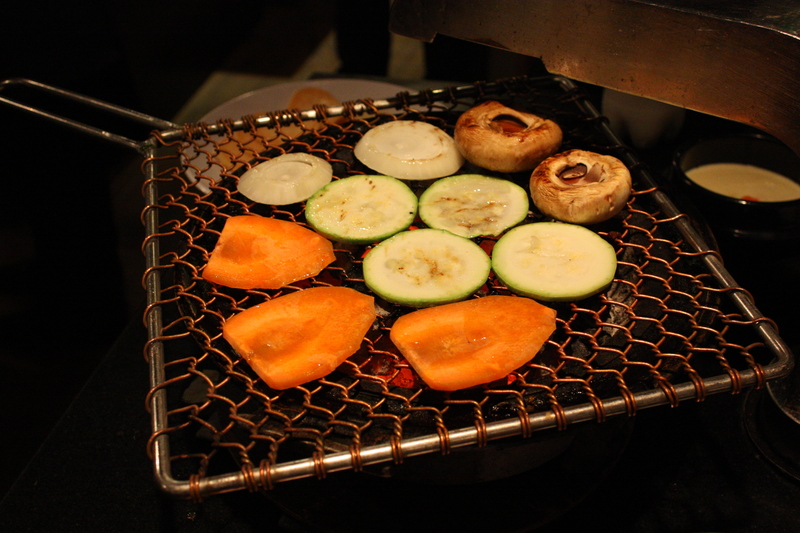 Our grilled vegetables looked much better than they tasted: mushrooms turned into blocks tasting of nothing but smoke, as did the potatoes. The sweet potatoes were the only things that could stand up to the smoke – they tasted terrific off the grill. We left, completely stuffed, faces hot from the grill and the makgeolli, another pair of students feeling lucky to be in Beijing. 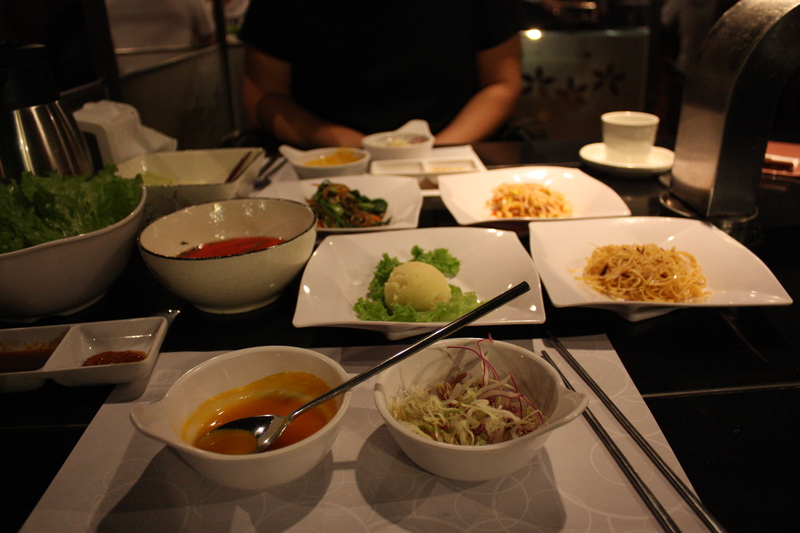 Price: Highly variable – we paid 48 RMB each for lunch, but dinner might run up to 100 RMB per person. On the surface, there isn’t much attractive about Wangjing. A series of blank, beige-grey highrise blocks, an enormously wide road. One of those sections of Beijing that’s a bleak architectural equation: lots of people, as many cars, not enough space. What makes Wangjing special – and worth visiting – is its vibrant Korean community. Here there are more families and professionals than in student-y Wudaokou, and the area has food to match, with a greater variety of delicious restaurants. Soon we were wrapping up the beef in lettuce and dipping in a sweet soy sauce, already happy with our lunch. 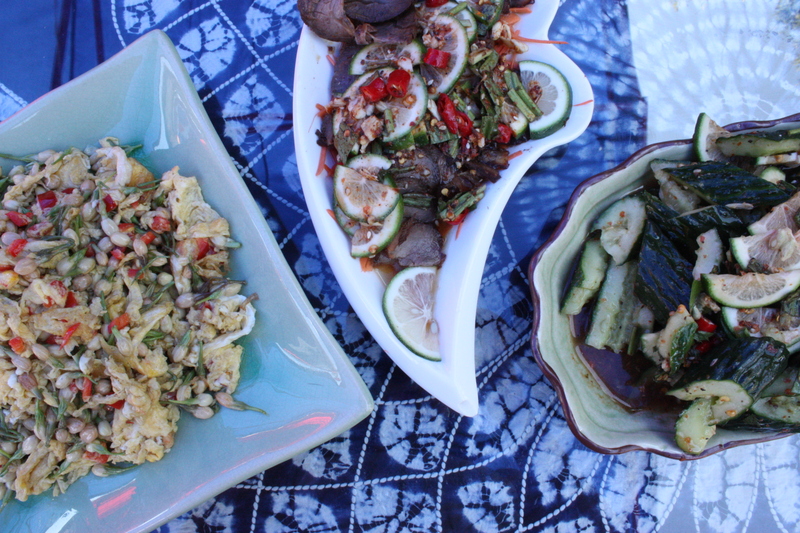 But then the side dishes began to arrrive: kimchi, of course; pickled green onions, a green salad with rice vinegar, tofu wrapped in fried egg, a salad with chili paste dressing – this was turning into a proper feast. Just about everything was delicious – though meant for two, this meal could easily have fed three, or even four. But the most exciting thing was a small bowl, whose contents we didn’t even recognize at first. 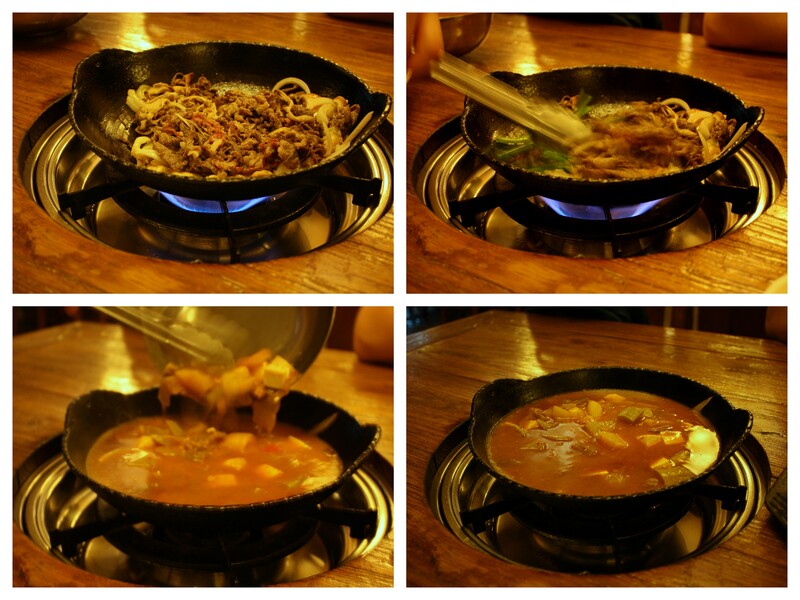 The bowl came sizzling and hot, but only had a thin layer of what looked like chopped vegetables at the bottom. It took us a few minutes to realize: this was chili paste, seared in the stone bowl with vegetables until it tasted even smokier, sweeter and richer. (This genius treatment for chili paste would be easy to do at home, too!) 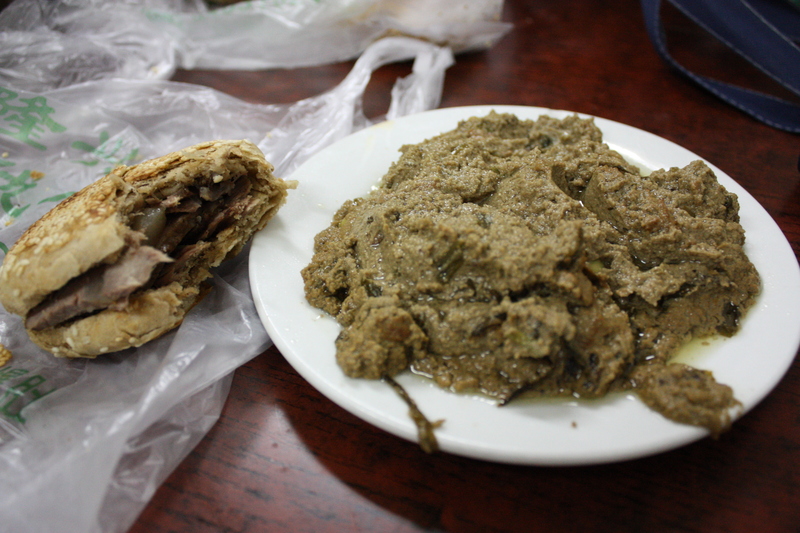 We proceeded to eat this with our beef and, when that was gone, stirred it into our soup, ate it on top of rice…seriously, this paste would have made a napkin taste delicious. Definitely a meal worth traveling for. Open 11 a.m. – 10 p.m. (I highly recommend going at lunch for best value). A Canadian student eats her way through Beijing and writes between bites.